The weather is changing slowly. It is starting to get warmer but you can still feel the chill in the air. every one is outside doing some spring clean up. Trimming some of the trees and just cleaning up after the winter. I went to go outside and was meet with stiff resistance. So I stayed in the security of the house. I get it, lets not temp getting sick with a cold or flu 🤧. But Staying in the house also has its drawbacks. I have to work slowly in order to go outside. I get so tired and worn down quickly. I have to build up my stamina. That takes time. Yesterday I had to go into the VA for an apointment. The reason for the apointment was to determine weather I had cancer. This makes no sense. You see all my medical is done at the VA. They have all the tests that were done. All the doctors work for them. So what is the apointment for. I am rated at 100% so that is not it. My rating cannot go up or down. I asked the Doctor why I was there and she simply stated that all the information that she needs to determine if I had cancer was in the files. Here is nothing I could add or take away being it is all recorded. The Doctor will finish the report and send it to the regional office confirming that I have cancer. I find this interesting. Because it has to do with cancer and deployments. Is there a link between cancer and my deployments. They have just recently acknowledged Agent Orange and its relationship to cancer after what 50 years. Now we are debating cancer and its relationship with Kuwait/ Iraq. I find it humorous how history repeats itself and they have no idea that they are repeating it as if it is the first time this situation has come up. Wars have consequences. We have not learned this lesson yet. Nation building is an approach that will never work. We are still suffering the effects of the aftermath of the two World Wars. The Middle East and Korea to name a few that are the result of Nation building. People suffer, the individual people. We tend to overlook them because they don’t have a seat at the table to voice their opinion. I don’t know why we worrie about these things. Why have children or plan on a future. Why buy life or medical insurance. Why save for the future. I have it on good authority that the world will end in 11 years. All the coalition of scientists are in agreement. If we don’t make major changes now there will be no hope. I was a denier. But with the scientific information that I have been told is out there it has to be true. I don’t know what the information is we just have to trust our scientists and the ones telling us. If you don’t beleive it it is because you are ignorant. Don’t stay ignorant safe our planet by repeating what they tell us. After all that know best. I sent my Doctor buddy a copie of my PET scan. He has a PET scan comming up next week. Comparing mine with his should make him feel good. 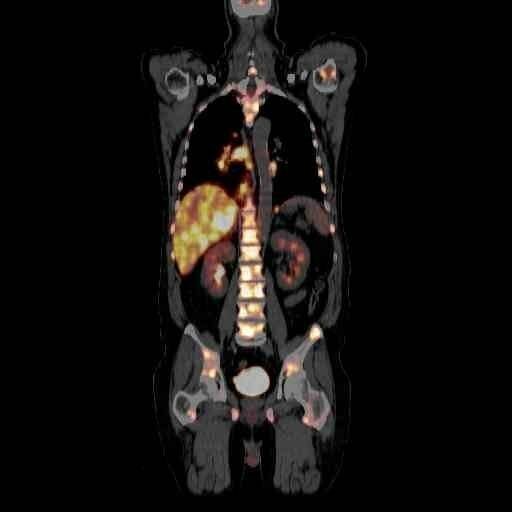 I challenge anyone of you to show me a PET scan worse then mine. Its all good I posted it the other day if you missed it here it is. I already used the picture so I have to change it. I will change it to the PET scan. So there you go. At least you don't have a copay. Seems like it's an excuse to charge someone something. I get that they're trying to 'figure out' if there is a correlation, but they could have reviewed your file. I think the VA is one of the mysteries of life we will never understand. Like the whole process with your diagnosis. I still don't understand how they did not catch it sooner? It's not like you weren't seen regularly. The most F'd UP thing in the US is healthcare, besides the government LOL . There is a copay for VA patients. I am 100% . those who are not have to pay. It is a misconception that all VETS get free health care. That is a myth. I still don’t get how it was not caught earlier. The problem with our healthcare is Obama care. We are still suffering for that. There is a battle between private care and national care. Its bad enough that the dem’s stop competition with healthcare keeping insurance prices high. Wait until you see how much free healthcare costs. I admit I had thought that once you were at 100% the copays went away. I guess that is my idea of an ideal that doesn't exist. I am not excited for any changes to healthcare. I am currently uninsured. If I were to get actual insurance again, I would probably be denied due to pre-existing conditions. I am signing up for a local clinic that you pay a monthly fee and they handle just about everything. 100/mo vs. 600/mo no question. I wish there were an answer. I'm not sure if there is at this point. Not that many people at 100 %. That is completely crazy. More signs things are completely broken. People need to stop praying to the government to solve their problems. All our problems are self-enflicted. We asked for it , voted for it. And still sit back and let it happen. People as a whole are stupid. Completely agree. Enough of the negative crap. There is so much more to life. Liking the new hair btw. I never let the negative stuff get me down. Its nothing but a thing. Sorry, they dragged you out there for no reason man. That scan is still a powerful image of how much you had to face. You are doing great. Still have a very long way to go yet. But we are making progress. Miracles do happen. So many prayers. That was a very, very hard time. Yea its just one of thoes things. What did you think of my picture. The more it glows the more consintrated the cancer cells are. On the positive side its Small Cell Cancer so there is no cure. So I got that going for me. There must be a reason, here we have the VA discussion about cancer as a result of the burnpits in Irak Thats shot just like that movie i told you about last month but dont let that Change your course , you are on your way to the Second life the after cancer one and you promised me a date so holding you to that ! Burn pits are a big issue here also. That was also brought up tuesday when I was at the VA.
To get that stated ? in short, let's just make the best of what we have now and enjoy life as we see it. I am just too happy that your condition is improving very well! That's a very alarming color over there and, I would have freaked out but, you got over it! Welcome! This is your second life! I understand. Looking at it makes me think of the whole process that you went through- being told by the doctor that you have cancer and, its metastasized. Going through chemo and suffering its effects. Having pesky people who thinks that you are dying simply because you had cancer and you're into chemo. Going through all that tests. That is difficult. This is what I want people to understand: Not all people who have cancer die. Most survive it especially when they were treated early on and, after recovering, they go on with their lives- just like the rest of us. Wow, what a story! Keep getting better. Wast of time. I find it funny because people want government healthcare. They have no idea what they are asking for. I have heard horror stories about the VA. It's shameful on so many levels. That’s government healthcare. And people are demanding it. Makes me laugh and sad at the same time.